Requirements: Volunteers need to speak basic Spanish. 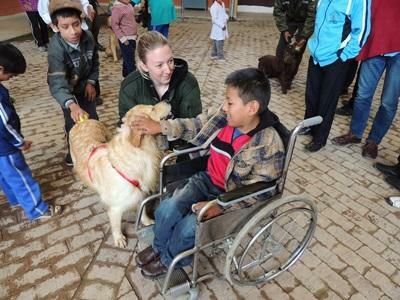 Volunteers on Projects Abroad’s Canine Therapy Project in Bolivia work closely with trained dogs conducting specialized therapy sessions with local children of all ages who are faced with a variety of disabilities. This is a unique project enabling volunteers to combine elements of our Care and Animal Care projects. Given the specialized field that you will be working in, we would appreciate volunteers with some studies or experience, either working with special needs children or working with dogs in some capacity. Projects Abroad works alongside a dog training centre in Cochabamba that is renowned throughout South America for training dogs that are highly effective in searching for drugs, bomb detection, and search and rescue missions. There is also a separate department that focuses on the social aspect and benefits of canine therapy with children. The canine therapy dogs are selected and trained to work with children who have physical and mental disabilities. Regular contact with animals can increase the children’s mobility, and both stimulate and comfort the children. Trained staff work with the dogs and the children using a variety of different exercises and techniques. As a volunteer you will work with the training centre, receiving guidance not only from Projects Abroad staff, but also from a supervisor at the centre. In the mornings volunteers assist with outreach work with the dogs, visiting centres and care homes for children with mental and physical disabilities. Your role on the outreach will vary daily. Each child is different and so each exercise and activity is carefully selected depending on the needs of the child. You will work with a wide variety of cases and be able to fully appreciate the positive impact this unique form of therapy has on the children. In the afternoons your work will be at the training centre itself. Parents from the local community bring their children for one-on-one sessions with the dogs tailored on their needs. Each case is carefully assessed before being accepted for therapy at the training centre. You will also have the opportunity to teach English to the local staff at the centre if you are interested. If you have experience training dogs in obedience and agility then you are welcome to get involved in the dog training for the therapy sessions or for drug identification with the local police. It is best for volunteers to have at least a basic level of Spanish for this placement to ensure that you can interact with the local staff and the children. However, please let us know when you apply if you have experience in this field but little or no Spanish so that we can make arrangements for you to have a translator, or you could consider taking a Spanish Language Course before joining the project.